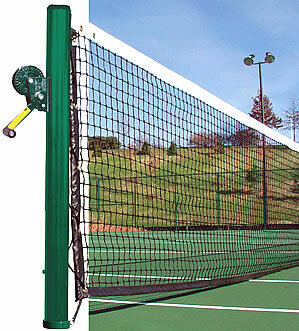 These tennis nets, posts, and reels bring your court the official touch it needs. They meet all U.S. Lawn Tennis Association (USLTA) standards, and they all ship by UPS. These tennis nets, posts, and reels will bring your court up to the standard that your future Andy Roddicks and Venus Williamses need to reach the highest levels of the game. 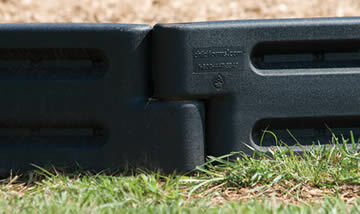 All three items are manufactured by SportsPlay, Inc., a leading playground and sports equipment manufacturer. These official tennis posts are made from galvanized steel. Their diameter is 3-1/2″. They have grooved aluminium caps, to position the net cable. Both the net reel and net fittings are included. Ships via UPS. Order online today! Weight (per pair): 82 lbs. Our nets are made from 3 mm double braid polyethylene netting. The net is 42″ long. The first 5 rows down are made from double netting. There’s a 2-1/2″ double reinforced headband and 8 rows of nylon stitching. 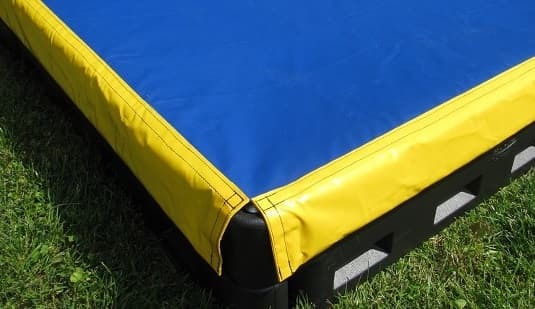 The steel cable measures 6 mm and is vinyl coated. The net has taped nylon bottom and dowels. Ships via UPS. 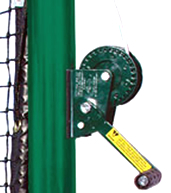 This tennis net reel adjusts your tennis net to the perfect height for athletic action on your court. Adjust the tautness or slackness of the steel cable in the net to the height you want. Go for the regulation 42″ net height, or develop better accuracy in practice by raising the net slightly higher. No matter what height you want, this net reel gives it to you. Ships via UPS. Order online today! †Prices listed do not include shipping.